We are in love with Ritz Carlton since our first encounter at the Arts Barcelona. 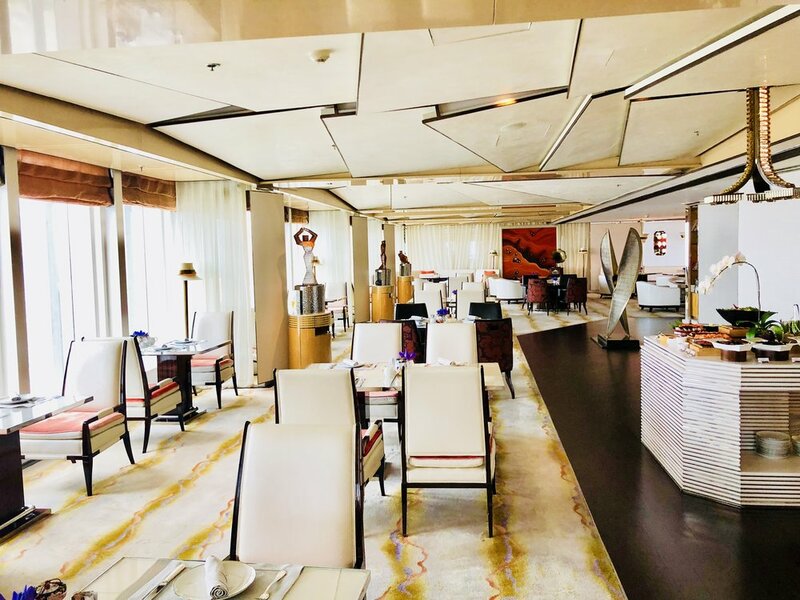 Even though we were told that the Arts is above par, all other Ritz Carlton properties could actually cope well with the high first brand experience. So no wonder that many of our travels have brought us to some of the renowned properties such as Istanbul, Abu Dhabi, Dubai, Doha, Hongkong, Vienna and now Shanghai. Just like almost all luxury hotel brands - to get confused or not - Ritz-Carlton has two properties in Shanghai, consisting of the first house in the city called The Portman Ritz-Carlton and the latest addition The Ritz Carlton Shanghai Pudong. Never would I have thought that anything can compete with our stay at the Ritz-Carlton Hongkong. Being the highest hotel was already stunning but the sumptuous design and the corporate smell inside the hotel made the experience an extra one. To all that comes that the Ritz-Carlton Shanghai Pudong is nearly identical to the Hongkong property in terms of identity, besides the height of course. When we landed at Pudong airport, we were picked-up in total style by ASD Car who brought us to our accommodation within 45 minutes. Being situated in the Pudong district, The Ritz Carlton Shanghai Pudong is closer to the Pudong Airport than if you would be staying on the Bund. Once we finally arrived at the hotel’s main entrance, we were helped with the luggage and shown the way to the elevators leading to the 52nd floor where the lobby and front desk are situated. A quick check-in later we were already shown to the room elevators accessible for in-house-guests solely. Our entry-level room was situated on the 45th floor, though upon opening the room door we knew that we received an upgrade to a Bund view room. 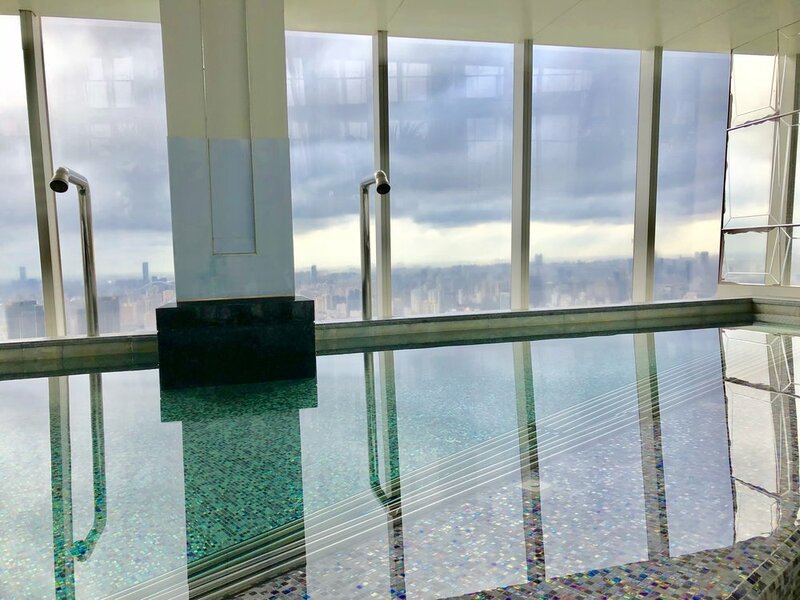 Even though that I am not too crazy about room views – I mean you can always enjoy the amazing views from the public rooms, the lounge or pool – this time I was impressed once again. Being still an entry-level room in terms of layout and size, I have to admit that we both fell in love with the style and spacious plan. Actually there were quite a few similarities to the room at The Ritz-Carlton Hongkong, especially the dazzling open-plan bathroom. Our Bund View Deluxe Room offered two heavenly queen beds, a sofa on the window with the most stunning bund views, a writing desk with two chairs and power outlets, a sideboard with a coffee machine and fresh fruits as well as a small walk-in wardrobe next to the entrance. The bedroom opened onto the open style bathroom that had a super chic vintage bath tub with curtains around along a built-in-mirror-television (should the view not be impressive enough), double vanities, a separate toilet (unfortunately no Japanese wash-toilet like at the rooftop bar or the Park Hyatt) as well as a super spacious walk-in shower with massive shower head and soft marble floor. All bath amenities were by Asprey (like at all Ritz Carlton hotels) and were replenished twice daily – just like the fluffy towels and the Evian water next to the sinks. Generally, the housekeeping was really top: they even put our shoes over a shoe bag or folded all our stuff lying on the sofa. Being booked in a Club level room, we were offered five pieces of complimentary pressing which was picked-up immediately after calling and brought back the same night. After having dropped off our shoes for shoe shine service, they arrived back in the room within three hours. The main reason for our stay in Shanghai was actually to show Lukas my favorite Chinese city (if you don’t consider Hong Kong being part of China yet) and of course to see our colleague Vivian, overseeing the sales and marketing of the Asian market. Since we took quite a while orientating in the room, we had to rush to our dinner appointment on the Bund. Even though the Ritz Carlton Shanghai Pudong has a few nice places to dine, it’s essential to get out of the hotel and feel the vibes of this gigantic metropolis. Our restaurant for the night was the Canton Table at the Three on the Bund overlooking the Pudong business district including the Ritz Carlton which looked quite small in the dazzling Shanghai skyline. 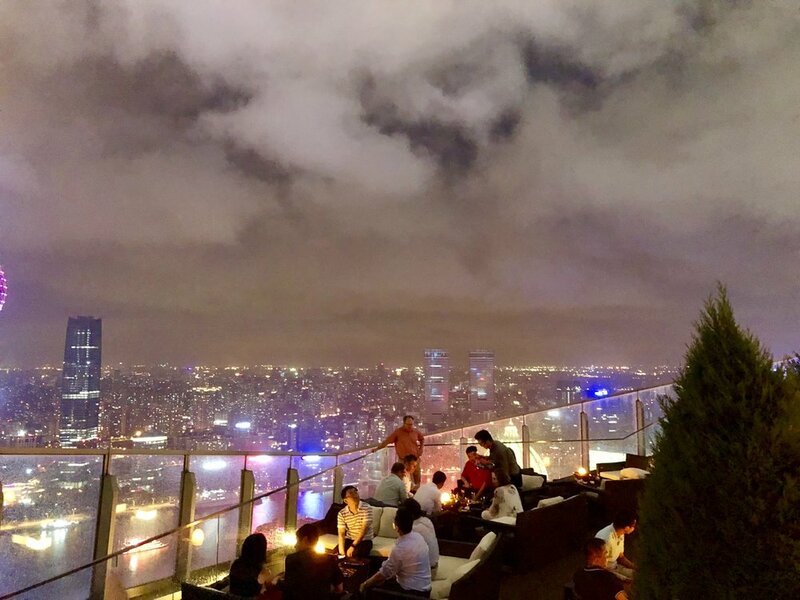 After dinner we went to the Flair rooftop bar which is the highest full open air bar in the world. Compared to Ozone Bar in Hongkong the service was not on par with the rest of the hotel. Unfortunately they didn’t reserve a table inside as well as outside and once we showed up we were told that no table would be available for us since it is raining and it is full. We still decided to go up to the bar and see there as the rain had stopped fortunately. Once we had a seat outside and were served drinks, it was quite nice. Even though the views and atmosphere were fantastic, Lukas and I preferred the intimate feeling of the Club Lounge. Honestly, staying at a Club level room at a Ritz-Carlton Hotel almost always feels like staying in a different hotel. The lounges themselves are already some of the world’s best ones, but the service makes them stand out. The Ritz-Carlton Shanghai Pudong is no exception especially when it comes to food presentations which are set up in breakfast (6.30-11am), mid-day snacks (11.30am until 2pm), Afternoon Tea (2.30-5pm), Hors d’oeuvres (5.30-8pm) as well as Evening snacks (from 8.30-11pm). My personal favorite was the Afternoon Tea which came on an étagère with salty and sweet dishes along free-flow Laurent Perrier champagne. There is a permanent selection of Chilean white wine, red wine, soft drinks, Perrier and Evian as well as Laurent Perrier along excellent crisps and bread along with excellent olives and cookies. On the first morning we slept so well that we missed breakfast entirely, however thanks to the mid-day snacks we were served a full brunch at 11.30 am and therefore was no need to be starting the day in wrong way. Later that day we made an excursion to a real market before we went to the pretty Yu Garden and then proceeded to Xintiandi – French concession area. Since it became dark already, we decided to grab one glass of champagne at the club lounge, took a shower and made us onto the way to The Middle House for dinner at Café Grey Deluxe. A short night was lying ahead of us with the alarm ringing at 6.30 am to have an extensive breakfast at the lounge with scrambled eggs (they don’t do Eggs Benedict here) before our car by ASD car service was bringing us to Pudong International Airport to board our Austrian Airlines flight back to Europe. Needless to say that this day was considered a food day considering the extensive breakfast selection (which for sure was the biggest Club Lounge buffet I have ever seen) and the amazing menu onboard Austrian Airlines. To be totally honest, this was an amazing way to end this year’s Asia trip –a top notch Ritz Carlton property as it should be in terms of interior design, service, location and lounge. On a hardware level this hotel was for sure a full 10 out of 10 points. As far as the software concerns, you simply have to bear in mind that you are still in China and processes are still evolving to become more efficient. Still, it was one of the best Ritz-Carlton hotels we have stayed at (while all of them made it into the Top 50 of our hotel experiences) and we can totally recommend it for a stay in Shanghai. By the way a city that is well worth a trip again as it became very green and developed with a lot of Western influence. We were guests of The Ritz Carlton Shanghai Pudong, however all above written expresses our own opinion and has not been influenced.